The Copper River Valley is a 3.5 million acre ancient lake bed located in the eastern portion of South central Alaska, traversed by the Copper River and surrounded by 4 mountain ranges - the Wrangell-St. Elias mountains to the east, the Alaska Range to the west, the Chugach to the south, and the Talkeetnas to the North. The Wrangell Mt. Range has some of the highest mountains in North America: Mt. Sanford (16,237'), Mt. Drum (12,010'), Mt. Blackburn (16,390'), and Mt. Wrangell (14,163'). Because of the spectacular scenery of these mountains, glaciers, ice falls, rivers, and abundant wildlife, many who visit the Copper River Valley find it the adventure of a lifetime. The area is rich in copper mining history, as the Copper River was once used to transport copper ore down to port facilities in Cordova. The abandoned Kennecott copper mine, located in the 13 million acre Wrangell-St. Elias National Park Preserve, is considered an outstanding industrial archeological site and has been designated a national historic landmark. Chistochina, a gateway to the park, is located at mile 32.7 on the Tok cutoff to the Glenn Highway, 42 miles northeast of Glenallen. Sinona Creek, Boulder Creek, Chistochina River, and Copper River surround the village. Eagle Trail was constructed by miners during the Gold Rush to the Eagle area in 1897. Gold was also being mined in the Copper River and its runoff creeks. The trail was used for construction of the telegraph lines from Valdez to Eagle between 1901 and 1904. Eagle Trail helped bring homesteaders to this wilderness area. 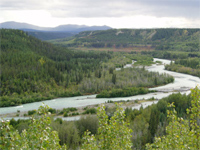 Chistochina is accessible year-round via the Glenn and Richardson highways on the Tok cutoff. Small aircraft may land at the state-owned 2060' long by 90' wide turf/gravel airstrip - CZO, CTAF122.9. Chistochina's current population is 104 - over half are Alaska native. Chistochina is the most traditional of all Copper River Athabascan Indian villages. Subsistence hunting, fishing, trapping, and gathering are the basis of the village economy. Beautiful handcrafts are made locally. Baskets, dolls, skins, furs, and beadwork can be obtained. Early in 1900, a two-story log roadhouse was built in Chistochina. Roadhouses served as early day hostelries. Spaced a day's journey apart by foot or dog team, the roadhouses offered food and shelter to everyone from miners to missionaries. Of the hundreds of roadhouses in the north, few remain. 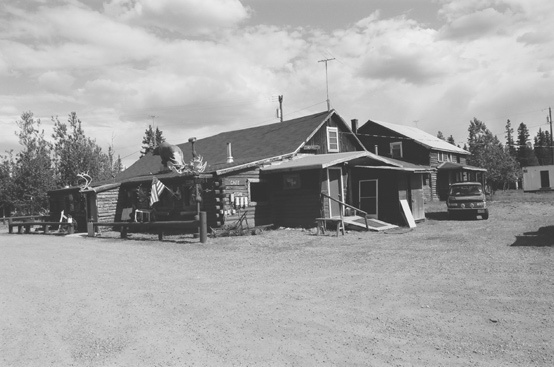 Chistochina's roadhouse, later called Chistochina Lodge and Trading Post, burned to the ground in November 1999. Some of the early cabins remain. Red Eagle Lodge, with its cabins, RV, and tent sites, is located on this historic property. The spirit of the original roadhouse lives on. Red Eagle Lodge is a place to come together, to share the warmth of a fire, to share a meal, and to share stories with fellow adventurers and travelers in the northland.